The weather was nice today so we went for a walk around the base. We stayed outside for about an hour, we played at the park and we ran around the fields. Our angels enjoyed throwing rocks down the hill. I just regret that I didn't bring the camera outside. 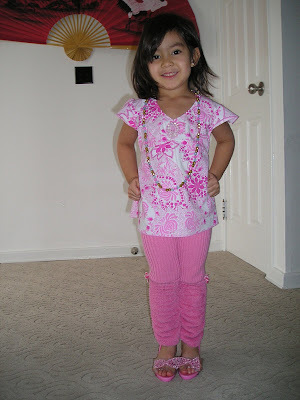 But I am posting this picture of our daughter, taken before we went outside. Have a good night guys, thanks for visiting and commenting..
Good morning everyone, how are you doing today? I am a still sleepy but EJ woke me up. He said I have to get up because there is a task waiting for me hehehe. My husband is at Duffy's right now, they were given a day off today just so they could watch the Super Bowl. I am so happy that the commander in here is very nice, thank you sir! All the sailors are happy!